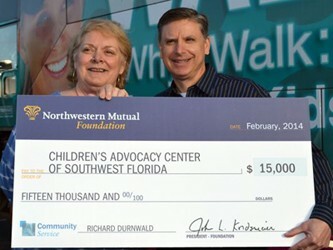 Rich Durnwald is being recognized by Northwestern Mutual, through its foundation, for his work with Children's Advocacy Center of Southwest Florida as a recipient of the company's 20th annual Community Service Award. Durnwald, a financial advisor at Northwestern Mutual – Fort Myers, was selected for his outstanding volunteerism, earning him a $15,000 grant for the advocacy center. The honor identifies 16 Northwestern Mutual financial professionals that demonstrate exemplary service with a local nonprofit, and awards the organization with a grant on behalf of the volunteer's work. Children's Advocacy Center is a crisis center that helps mentally, sexually and physically abused children through therapeutic counseling, parenting education and preventive programs. Durnwald became involved with the organization in 2008 when he was asked to participate in a capital campaign and was struck by the number of children affected by violence in his community. Currently, he serves as the board president. The nonprofit will use the grant money to fund its Pine Manor afterschool and summer program, one of the organization's community outreach prevention programs for at-risk children.